“The data strongly suggest that I-502 has achieved one of its primary goals – to free up limited police and prosecutorial resources. These resources can now be used for other important public safety concerns,” says Mark Cooke, Criminal Justice Policy Counsel for the ACLU of Washington. The data also show that the number of court filings for other drug offenses (including felony marijuana charges like growing, selling, and possession of large quantities) have stayed relatively constant. 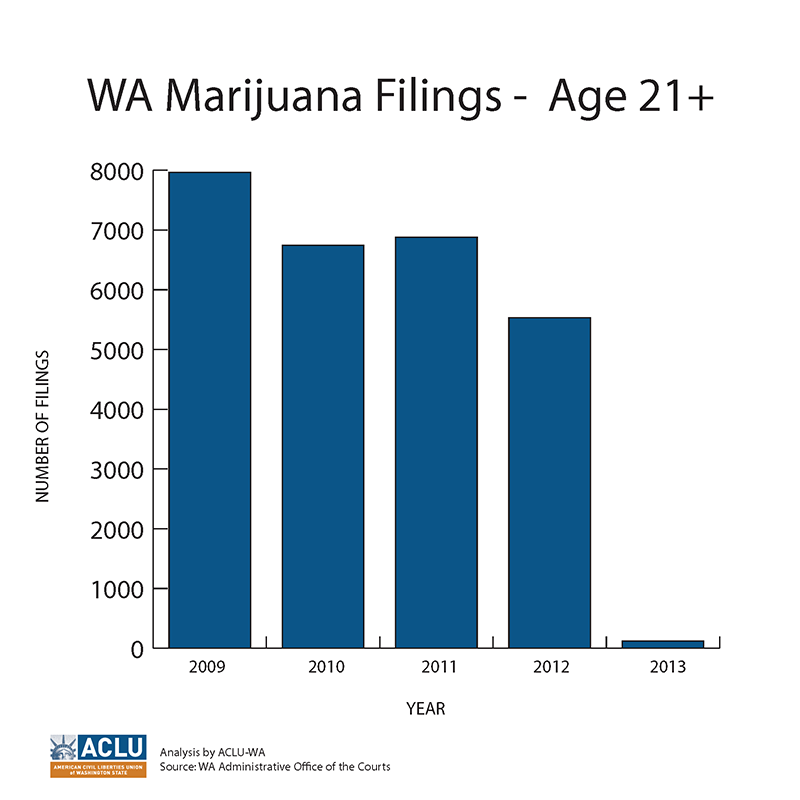 Court filings for both marijuana and other drug offenses by individuals under age 21 have dropped to a lesser degree in recent years, indicating that I-502 is likely not the main driver of those decreases. Although the overall number of low-level marijuana offenses for people age 21 and over has decreased significantly, it appears that racial bias still exists in the system. An African American adult is still about three times more likely to have a low-level marijuana offense filed against him or her than a white adult. Initiative 502 legalized possession of up to one ounce of marijuana for adults 21 and over. However, possession of more than an ounce, but no more than 40 grams, remains a misdemeanor. Exceeding the one-ounce threshold is a likely explanation for the presence of 120 misdemeanor filings against adults in 2013. The ACLU of Washington analysis is based on data provided by the Washington Administrative Office of the Courts via a public records request. 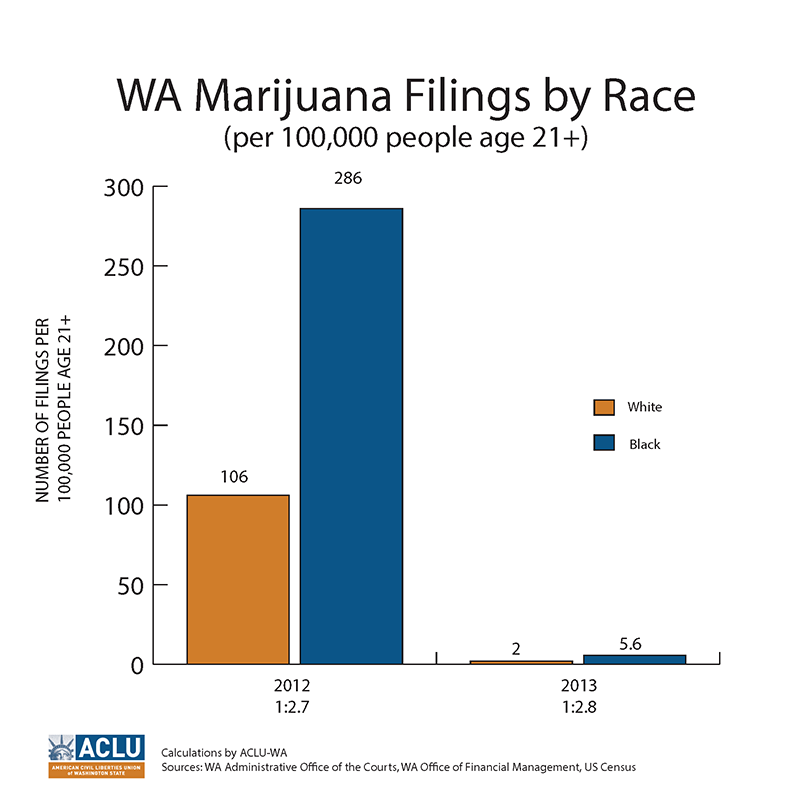 The bar charts below illustrate the court filings data and racial disparity trends. To learn more about I-502 visit: www.aclu-wa.org/initiative-502.